Dartford open the scoring. Picture: Terry Rickeard. Hemel Town slipped to a 2-0 defeat at Dartford in the Vanarama National League South on Saturday. With the pitch being very sodden after overnight and early morning rain, the Tudors welcomed back Reiss Greenidge, from Ebbsfleet United - Reiss being the son of former West Indian great Test batsman Gordon. Remembrance silence. Picture: Terry Rickeard. Much of the first half was a midfield battle, with neither goalkeeper being truly tested. The best player on the field of play was Dartford’s right winger Lee Noble, who was a constant thorn in the Hemel defence. It was not until the 40th minute that there was any meaningful action. Home left-winger, Danny Harris, cut inside from the left and curled the ball past a helpless Jamie Butler, into the bottom right hand side of the net for the opening goal. At the start of second half McNamara was replaced by Scott Neilson. Jordan Parkes tried to keep up his goal-a-game ratio, but was denied by either the home goalkeeper or shooting just wide. Dartford v Hemel. Picture: Terry Rickeard. At the midway point of the second half Lewis Taaffe replaced Michael Thalassitis and Graeme Montgomery for Kyle Connolly, as the Tudors looked to chalk off the home advantage. But as much as the Tudors tried they were unable to break through to the home net, despite their endeavours. Then in the 80th minute a breakaway move saw substitute, Luke Wanadio sprint clear of the Tudors defence and coolly beat Butler making the game safe for the home side. Jordan Parkes, then picked up a booking for an act of frustration, deep into added on time. Hemel host Truro in the league on Saturday. 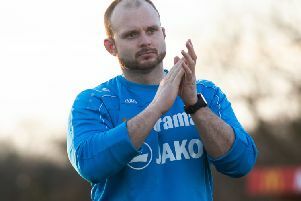 Hemel boss Dean Brennan. Picture: Terry Rickeard.